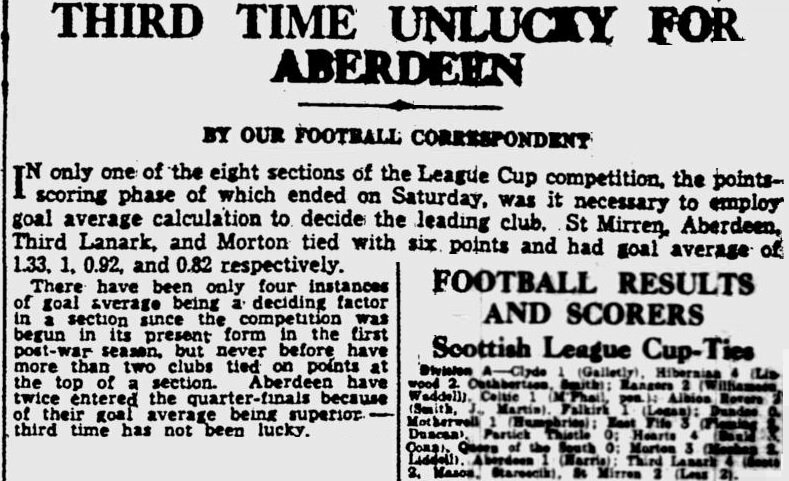 A shocker, with Brechin leading 3-1 at half time. 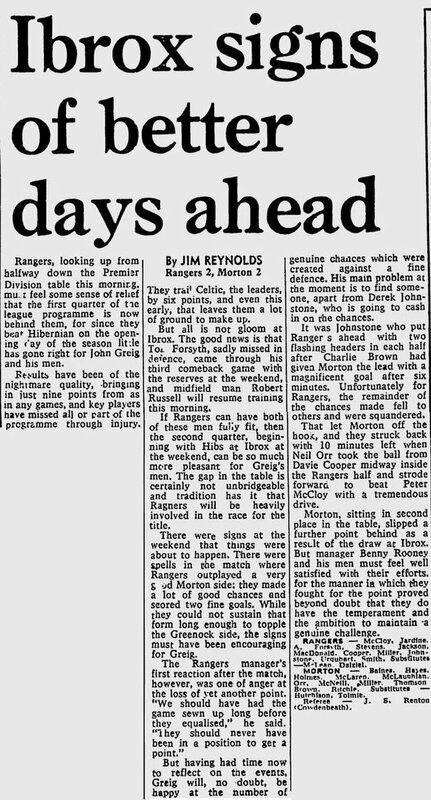 Injuries to both David Wylie and Robin Turner meant we got Hamilton's Rikki Ferguson on loan for one game. None of the four teams above us won either, but this was a terrible result against the league's bottom side. 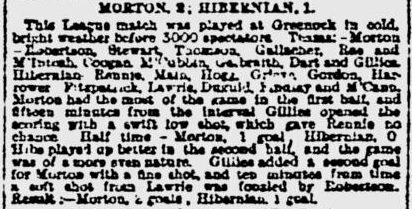 League Cup 2nd leg - agg score 5-4. 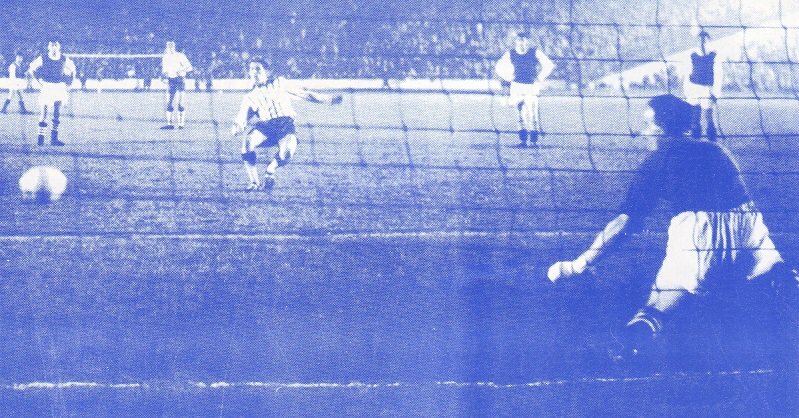 League Cup Semi Final at Hampden. Our goal (at 2-0 down) is at the 7:05 mark in the clip. Peach of a goal too. Edited by AyrshireTon, 18 October 2018 - 07:09 PM. Edited by AyrshireTon, 18 October 2018 - 07:08 PM. What happened to part 1? League Challenge Cup semi final. Had to sit nearly 40 minutes waiting for kick-off due to the team bus getting stuck in traffic. Great save from Wylie in this one. It was only 1-0 because of Erik Sorenson. 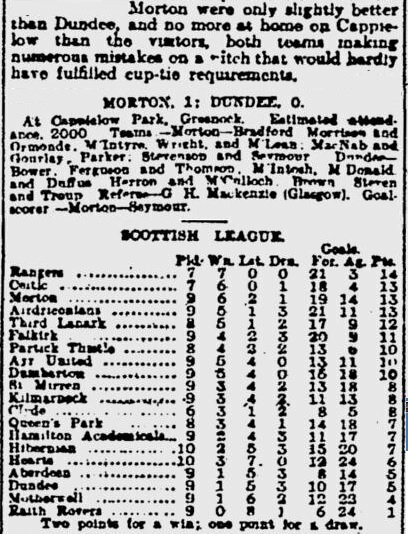 Scottish League Cup group stage. This was the start of a very strong run of results for us, seeing us climb to the top of the Premier League and reach the semi final of the League Cup. Edited by AyrshireTon, 13 October 2018 - 07:50 AM. Edited by AyrshireTon, 13 October 2018 - 07:49 AM. 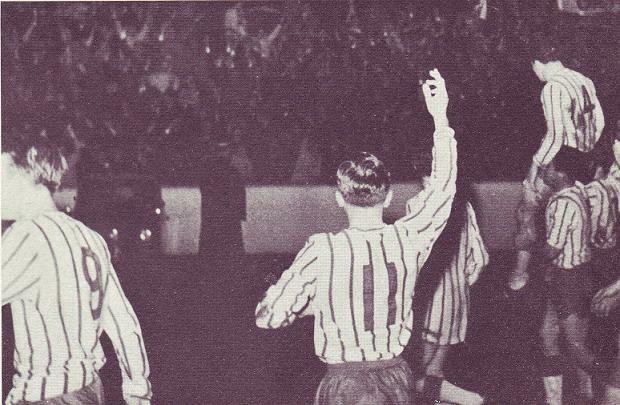 Team: Johnstone, Higgins, Fyfe, Campbell, Aird, Whyte, McInnes, Garth, Crum, McAloon, Kelly. 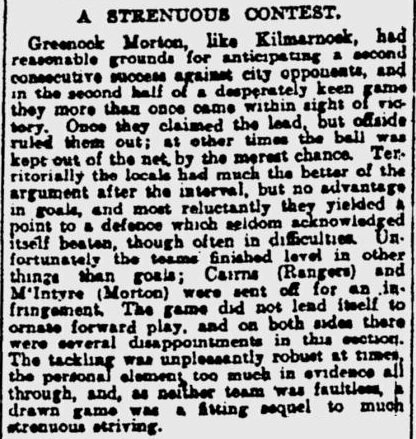 Morton played towards Port Glasgow in the first half in front of a crowd of about 5,000. 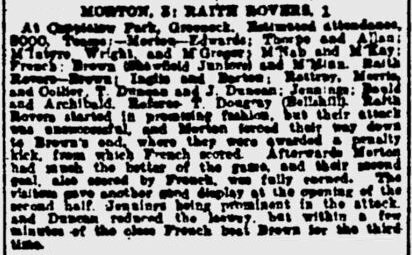 Morton’s first chance came from a Kelly break downfield following a fleeting Queen’s raid, but the chance ended with a poor try into the side netting from along the touchline. Then a long free kick from Andy Fyfe was helped by the wind and McAloon just missed heading home to the right of the goalmouth. Two 20-yard tries by McInnes were then safely held by Steadward in the Queen’s goal. Whyte closed in on goal but had his try charged down. Kelly then caused a gasp of disappointment with a curling high shot from the left just missing the right-hand post. Crum broke through twice, but Steadward again charged down the shots. Crum then had a further three tries for goal all blocked by Queen’s defenders. 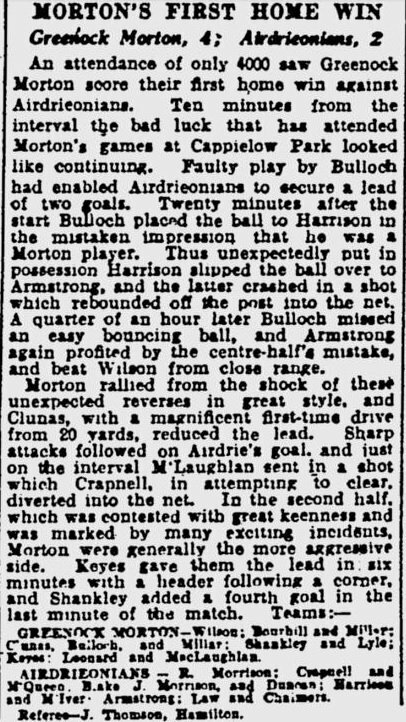 Steadward punched a ball away from McAloon’s head after a cross from the left. GARTH finally opened the scoring, driving safely home after a nice Kelly cross to his feet, following a poor fumble-punched clearance. Kelly, despite being badly unmarked, could only slice-kick to a Queen’s defender following an accurate goal-line pass from Crum. Kelly then banged Morton’s next chance wildly over the bar. 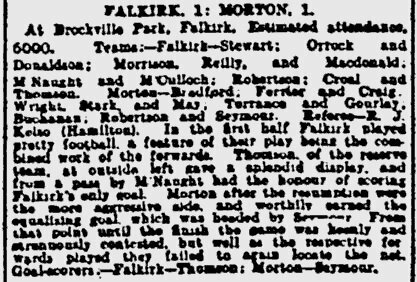 Morton were then lucky following a goal-mouth scramble, with Higgins’ out-stretched leg saving the goal. 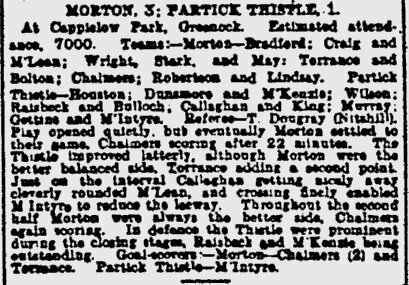 The last action of the half saw a nice save from Johnstone in the Morton goal, parrying a whipped-in arcing shot from Harris and then gaining full control of the ball. 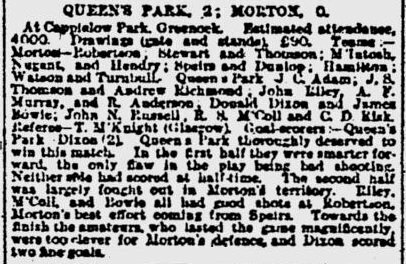 The second half started with two Queen’s forwards breaking through, but Johnstone dived to save at their feet. 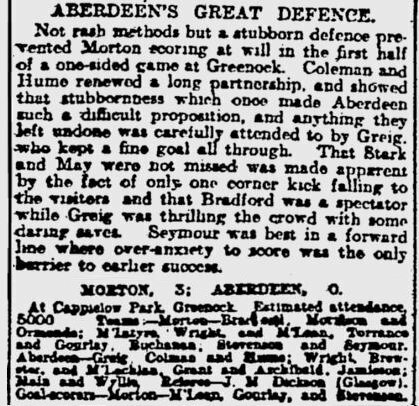 However, the ‘Ton keeper received a kick in the head for his trouble and was off-field receiving treatment for the next ten minutes, McInnes covering in goal. 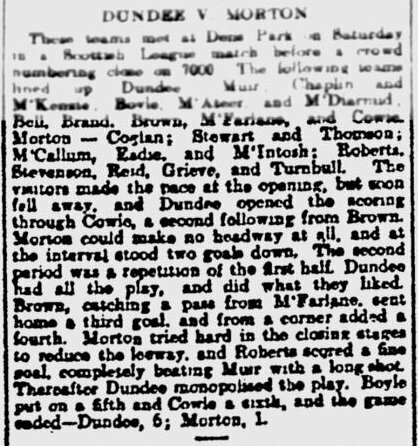 McInnes almost immediately made a fine diving save of a curling shot that was going in at the lower right-hand post. His only other action was the clearance of a pass-back before Johnstone returned. McAloon got the ball slap in the face from a Campbell try from the right, recovering after minor attention. 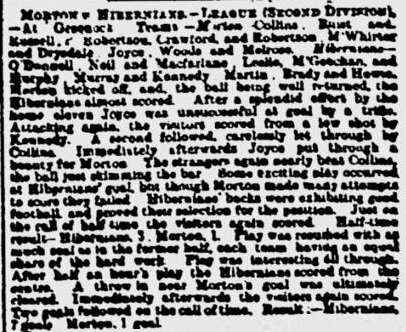 Then McAloon dribbled right up the left touchline before crossing to an in-rushing McInnes, but Steadward was ready and made a fine intercepting dive from the left post. 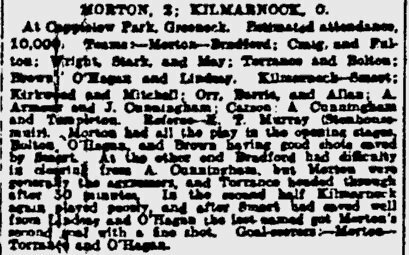 Then Aitkenhead for Queen’s broke away from Higgins and sent in a waist-high shot that curled away from the Morton defence but right into the path of the in-rushing McIntyre, who headed safely home for a Queen’s equaliser. Oh-oh! 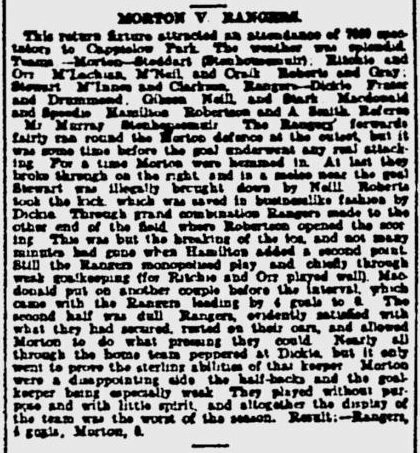 Morton replied strongly, with McInnes lobbing a bouncing Kelly cross over the bar, then sending another lobbed effort against the bar, and finally having two further shots blocked. 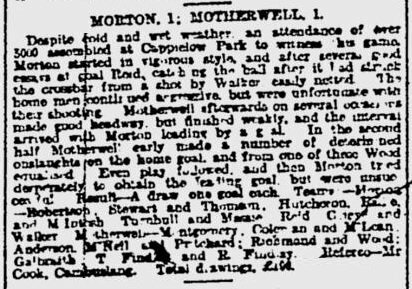 Crum was then carried off injured for a few minutes, with WHYTE restoring Morton’s lead from the penalty spot, J. McColl and Caldwell having fouled Crum when he was goal-set. 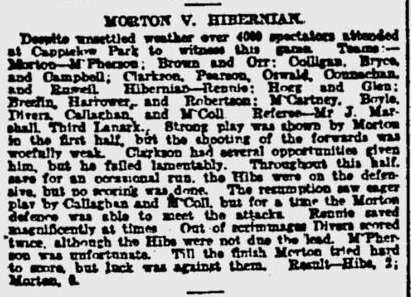 A Campbell lob then went just over before KELLY beat J. McColl to a ball that looked almost certain to cross the bye-line, whamming home from a narrow angle on the left. 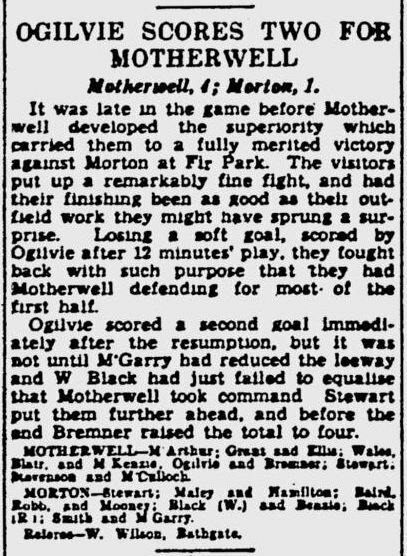 Garth then helped to seal what finally became a comfortable victory, beating two men at the left near-post and crossing to CRUM who easily netted Morton’s fourth. Edited by torontobee, 14 October 2018 - 04:42 PM. A couple of great strikes from Scott McLaughlin and Chris Templeman. League Cup semi final replay. Played at Ibrox. Some cracking goals in this game. Two defeats on the bounce after Queens score three in the first half. 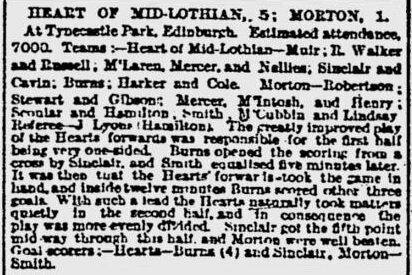 Better news following this game, though - Derek Mcinnes would be back next week after a long injury and we signed two Finnish players. 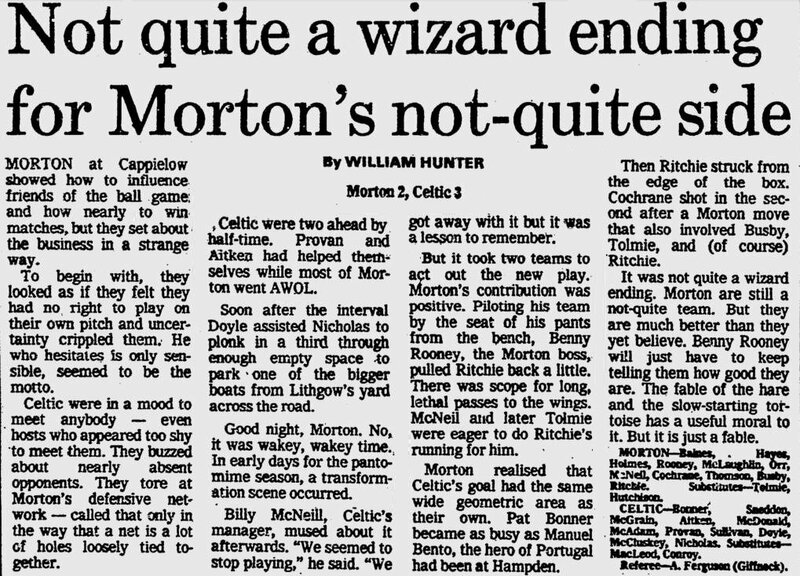 A game going absolutely nowhere until Ian Clinging curled one in from the edge of the box in the dying minutes. The second goal from the Queens game, seen from the away end. 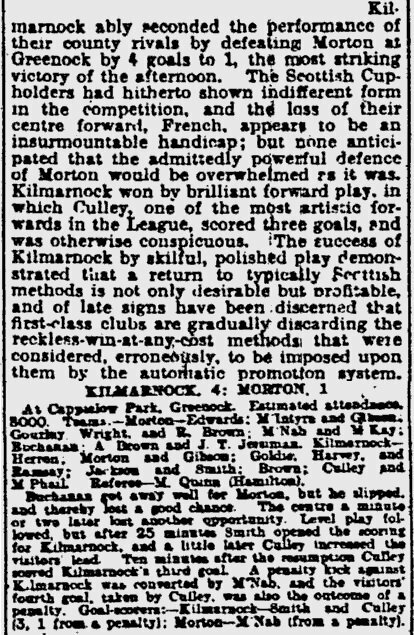 Played at Cappielow. Howler from Andy Carlin for the opening goal. Our first trip to Forthbank. I remember being monstrously hungover at this one. 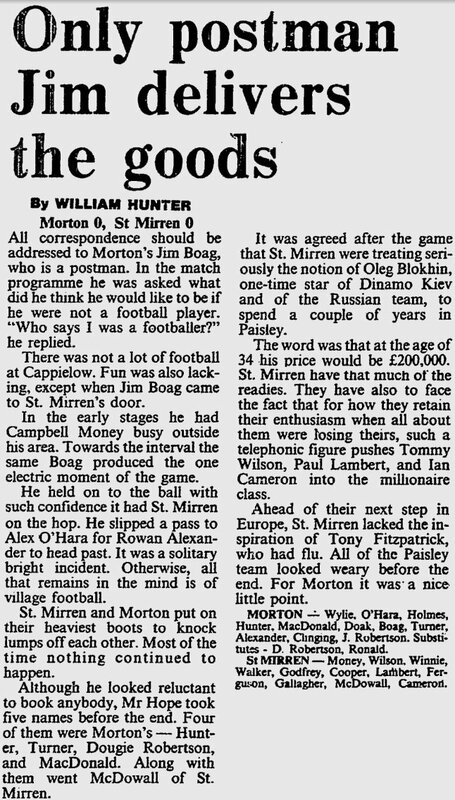 1990 - Morton 0-0 Cowdenbeath a.e.t - Cowdenbeath won 8-7 on penalties. League Challenge Cup. Two hours of appalling football then Derek Collins sticks his penalty into the coal yard. A pumping off the eventual league winners. League Cup group stage - final game. Everyone finishes on 6 points so it's down to goal average. Beaten by late acute angled volley from Lee Griffiths. Have to admit it was a great strike. Our equaliser was a Twaddle free-kick out on the left which everyone left. As a Jambo he fair enjoyed it. Pars still topped the table with us in 4th place, 4 points behind. 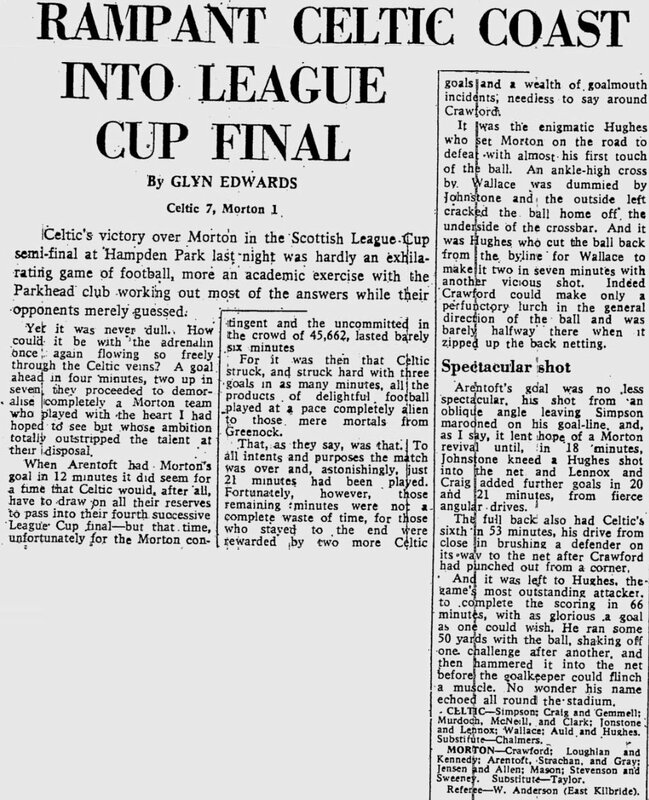 Ayrshireton, I haven't checked but was the 1-0 win v Clyde in 2008? I thought it was 2009. Won league in 07, stayed up by skin of teeth 08 under Irons. Finished 6th or 7th in 09.